The Gypsy's Guide: Paris Week: A Thirty-Something Blogger on "Julie & Julia"
Paris Week: A Thirty-Something Blogger on "Julie & Julia"
I left the movie theater pensive, teary, and, frankly melancholy. Not because “Julie & Julia” was a sad movie in the least – the film glows with joy. Nora Ephron has created an elegant love letter to America’s favorite French chef and the blogger who made her name while making Julia’s recipes. 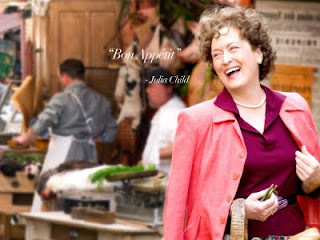 Indeed, Meryl Streep brings luminosity and comedy to her tall, solid Julia Child – traits which, by all accounts, the real Ms. Child possessed in spades. And Amy Adams’ portrayal of Julie Powell is one of humor and life as well. But when I left the movie theater last week, I wasn’t filled with a great sense of joie de vivre. Instead, I was fighting back tears. Not only is this a movie about two women separated by half a century, it is also about their two cities separated by time as well as an ocean. Julia Child’s Paris is gorgeous – too gorgeous for post-war France. But that’s part of Ephron’s fantasy. Paris is, once again, a city of colorful markets, tidy streets, and charming patisseries where there is never a shortage of butter for the woman who loves butter as much as I do. Julie Powell, however, lives in Queens – the antithesis of Paris – on a noisy street above a pizzeria. Where Julia walks into her new Parisian apartment and declares, “It’s Versailles!” Julie turns around in her dingy kitchen and asks her husband, “What are we doing here?” Julia flourishes in Paris; Julie flourishes living vicariously through Julia. On the surface both women find their salvation in cooking. Indeed, as Julia heads to Le Cordon Bleu and Julie to her tiny, dysfunctional kitchen, it seems they both will end up cooking their way to happiness. And they do, sort of. But if that was all there was to the story, I’d have just left the theater hungry. Indeed, there’s no fighting it: you will leave the theater hungry. From piles of onions sliced for practice to boeuf bourguignon, decadent chocolate cakes, lobster thermidor, to the most gorgeous roasted chicken you’ve ever seen… the film is a visual feast. My Diet Coke and Twizzlers were rather unsatisfactory in comparison. 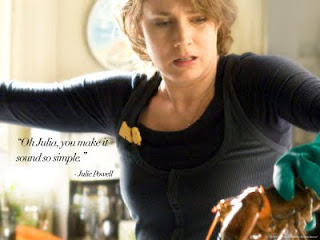 And therein lies the problem… after “Julie & Julia” I am having trouble being satisfied with my own real life. Both Julie and Julia have husbands they adore and who adore them. I am so lucky to recognize that look on Paul Child’s face as he looks at Julia as the same look my own husband gives me. Where Eric is Julie’s greatest cheerleader, so, too, is my own husband mine. And when Julia reaches across the dance floor to grasp her sister’s hand, my own hand fluttered, thinking of holding my sister’s hand at her wedding last year. The pain on Julia’s face when a baby carriage passes… I know that pain. As Julie struggles with blogger’s narcissism – a natural byproduct of writing about yourself and your life all the time – I see myself and think, “I have to let this one blog post go and call my sister instead.” Both women ride the proverbial publishing roller coaster – the agony of rejection letters I know too well and the joy of acceptance. I remember the first comment I got on my blog. The dance Julia does when her book is finally accepted for publication – I did that dance, too. And the last vignette – as Julia holds her published book at last – left me breathless with its honest glee, a feeling I can tell you is exactly how I felt the first time I held my book, too. But it is that question that all bloggers ask – “Is there anyone out there reading me?” – that cuts to the quick. Julie Powell had incredible, out-of-the-blue, phenomenal success as a blogger and then as a writer. Heck, I used to read The Julie/Julia Project when it was just a baby blog. And like Julie all bloggers dream of the book contract and the movie deal that allows us to leave our day jobs to do that which is truly fulfilling. Yes, even you sitting there so smug. You know that’s the pie-in-the-sky fantasy. And we tell ourselves that it DOES happen. I mean, it happened to Julie, right? Otherwise, it is far to easy to feel like we are just spitting these words out… countless words day after day… words for which we don’t get paid but which we write because we hope that one day the book/movie/syndication fairy will drop in out of the sky and click that little “contact me” button in the right hand column… and suddenly all of that work and effort will be worth it and we, too, will have 65 phone messages from agents and publishers and t.v. producers and our books will “change the world” just like Julie and Julia’s did. Until then, though, we must carry on. We thirty-something women (and my birthday last week planted me closer to the movie’s Julia than to Julie), we must “be fearless” as Julia admonishes. “Never apologize. No excuses. No exclamations,” she declares as she scoops up an omlette that didn’t quite flip in the pan. And this story of two women in their thirties offers an anthem of solidarity to us all. There is more out there than making hats or answering phones. And while we may right now be working to keep the creditors at bay or to keep from defaulting on our student loans or to keep the bank from foreclosing on our homes, like Julie and Julia we must not bury our true loves. Those passions we feel are not silly indulgences. And the relationships we have are to be cherished and fed with buttery goodness. And when I write all of that, I feel that wave of inspiration and joy that Nora Ephron wants me to feel… but it would be a lot easier to believe it all if I could look out the door and see Paris. Ang, You're not the only one to notice the similarities between you and Julie. As I walked out of the theater Monday night, I said to my friend, "You've just watched my friend Angela and her husband." To a 't' my dear, and you're equally adorable. We are out here. Your faithful readers. We may not always comment, and we're not the New York Times (yet), but we're cheering you on. loved this review. i am trying to wait to see it until it comes out on dvd, when i can watch it with my mom, sister, and aunts. i read the book, and of COURSE love julia c. now you've made me want to see it even more (if possible?). thanks! oh yes we are out there, and read every delicious word that you write and love you for it. Yes, it was also YOUR story, we all can't wait to read the next chapter. Stay with it, sweet girl! Must go and see this movie. Am a big fan of Julia Childs going back when... well enough said. I'm printing out your post and sharing it with my book club when we meet to watch the movie and discuss the book. I got the exact same message--but probably can't say it so well. I saw your link on twitter. I loved this movie as well. Just blogged my review in the Books on Screen column at 5 Minutes for Books, but I also took a more introspective view in my post on my blog about Julie Powell. Great great movie and concept. This is a fantastic post, Angela. Thanks for sharing your innermost and we are indeed out here reading and rooting for you! Thank you all for your comments! Green Girl, I'd love to hear what your book group says about the book and the post. Wonderful review Angela. Your readers are out there! Many of us just don't usually comment. This blog shall be an exception. I too felt a little melancholy as I left the theatre. I wanted to know why the real Julia Childs didn't like Julie's blog. I was unsatisfied there was no postscript. I wonder if Julia ever read the blog. The rich relationships in the movie are as delicious as the rich food. I want to get a copy of Julia's book and try some of her recipes. I too know the sadness of passing by the baby carriage. I know the joy of 2 wonderful sisters. I know the joy of having a wonderful husband, but also the pain of losing him. Sometimes even those relationships don't work out. I want someone to be the butter to my bread, but I'm still looking.